American Telemedia can help you to cost-effectively produce video to successfully convey your message and support your business objectives. We can package the videos as either complete programs or as learning objects integrate with your eLearning training programs. Plus, we can provide training in all of the above areas to enable your staff to successfully produce business television programs. Why American Telemedia for video production? We produce top-quality video productions with professional actors, professional script writers, and award-winning producer-directors. You own the programs and ancillary materials that we produce for you; we don’t. That means you can show the programs to as many people as you like, for as long as you like without ever paying a renewal fee, a license fee, or a seat fee to American Telemedia. We are instructional systems designers, not just television producers. We are intimately familiar with, and faithful followers of, the Instructional Systems Design process. We design our programs to convey critical information and to teach skills and knowledge that make a measurable difference. We own our own broadcast-quality non-linear, digital editing suite. Our Emmy-award winning team ensures that video productions are of the highest quality. We are experienced. Our business satellite clients include national and international corporations such as Lucent Technologies, Bogen, and Avaya. 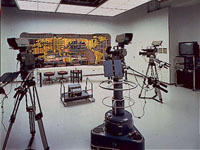 We have produced dozens of successful satellite broadcasts for them. We are flexible. We are available to perform on an as-needed basis to help you fill-in production and development gaps for any given broadcast project. If you would like to learn more about our business television program development services, please let us know. Previous: Previous post: Are You Spending Too Much on Training?